The side that made sure of the championship after beating Balluta 3-2 at Sirens Pitch on September 3, 1964. (Standing) Joe Chetcuti, Carol Calleja, Jimmy Micallef Eynaud, Bertie Portelli, Anthony Ciantar. (Front) Joe Ellul, Alfred Portelli, Tony Albanese, Joseph Wismayer and Wilfred Mamo. Through the unstinted efforts of Angelo Debono, Loris Manché and Stanley Ellul Mercer, ably aided by newcomers to the club administration such as Wilf Mamo and Jimmy Micallef Eynaud who were both still on the playing staff, Tony Coleiro (even he put up an occasional appearance in the sides), George Sclivagnotis and others, Neptunes were becoming more organised. The concept of having someone in charge of the playing squads was at last becoming ‘acceptable’ and was considered a must. Year in year out members of the ‘old brigade’ were given the onus of conducting the pre-season land training, which, unfortunately, was attended by a very small number of players. 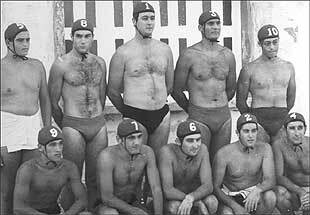 Enthusiastic but very raw youngsters, unaware of the rigours the waterpolo game entailed, did not take long to call it a day. Portelli holding high the championship shield. Franz Wismayer, Joe Albanese and John Degiorgio all carried out, over the years, circuit training in an effort to bring the players in shape for the impending season. Carol Calleja and Freddie Portelli meet again after so many years. However, the dynamic Angelo Debono was adamant that Neptunes returned to winning silverware as the fare being offered by the up-andcoming youngsters gave a clear indication that success for the club was not far away. Members were convinced that our team possessed good players but somehow the ultimate prize was eluding us. With Joseph Wismayer and Tony Albanese entering the scene at a relatively very young age, the Neptunes team started having a sounder look. 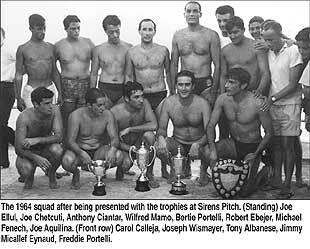 In 1964 our president decided to sign on Freddie Portelli, then a teenager, from Sirens. Portelli was at that time gathering fame when he formed part of one of the most popular musical groups at the time “The Black Train”. Later he became recognised as Malta’s top Rock Star. The 1964 official photo shows the team with the Times of Malta and Il-Berqa Shield and the Kitty Kola Cup. 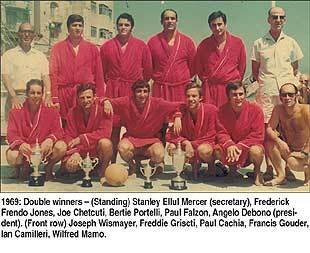 Missing from picture are Joe Ellul and Freddie Portelli.The 1964 official photo shows the team with the Times of Malta and Il-Berqa Shield and the Kitty Kola Cup. Missing from picture are Joe Ellul and Freddie Portelli. A ‘toddler’ by the name of Joe Chetcuti, who eventually proved to be a fast swimmer and a sharp-shooter established himself in the side. Neptunes had not won the first division championship for fourteen years! The League campaign had started drearily for us with two consecutive 1-0 defeats to Sliema and Valletta. The turning point came when Dr Manché offered his services as coach. Through his perseverance, discipline and his knowledge of the game, we totted eight victories all in a row, which gave us the ultimate prize after so many years in the wilderness. We also went on to win the Cup. The Neptunes team was being consolidated and UK Services personnel were engaged regularly to bring the players in shape. 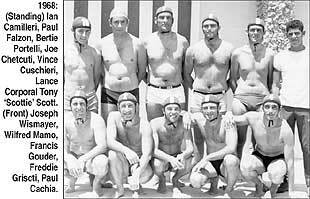 The waterpolo community was rocked in 1968 when Neptunes announced they had engaged the services of one of the best all-round waterpolo players Malta had ever produced, Freddie Griscti. This signing from neighbours Balluta strengthened Neptunes immeasurably. The 1967 Kitty Kola Cup final between Neptunes and Sirens had ended in a draw. Due to the lateness in the season the replay was due to be played prior to the start of season 1968. But Sirens maintained that Griscti could not take part as in 1967 he was not on Neptunes’ books. The ASA snubbed Sirens’ protests and so Neptunes were declared winners. The end of the Sixties saw Neptunes win their fourth Double in 1969. Griscti and Chetcuti had combined to mould our side into a formidable one. Paul Cachia, however, will long remember the penultimate league match against Balluta, for his brilliant goal four seconds from time that set seal on the league championship. An earlier save by our goalkeeper Paul Falzon from a penalty throw in this match also contributed to our triumph. The usually solid Bertie Portelli, Ian Camilleri and Joseph Wismayer were the other ‘regulars’ that season.